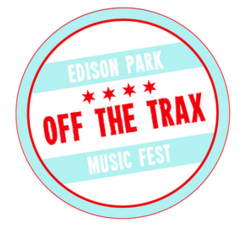 This upcoming weekend (May 5th-7th), Edison Park will be hosting it’s second annual, three-day musical event, “Off the Trax Music Fest” sponsored by the Blue Moon Brewing Company. Last year, over 5,000 people were in attendance throughout the weekend catching performances of numerous talented groups. This year’s music festival is set to feature over 30 bands at four of Edison Park’s venues! All venues are walking distance from each other, and you can even purchase an all-inclusive pass that allows for unlimited music all three days for only $15! Over the course of three days, the audience will get the opportunity to hear music of all genres, ranging from blues, country, rock, and even some cover bands. In addition, they can expect a lot of Blue Moon giveaways, and some really great food! Some of the headlining acts this year include Karin Elizabeth & the Remedy Band on Friday at the Firewater Saloon, Without U2, a U2 tribute band, on Friday night at Moretti’s and Don’t Speak, a No-Doubt tribute band on Saturday night at Emerald Isle. ← Previous Story Best Dressed at the ACCA’s! Warped Tour: Being As Ocean! Solange And Son Dance At Her Wedding! Cassadee Pope REALLY Wants Your Vote & Her Special Guests Agree!